One of my favorite things to do on beautiful days like today is to head outside and see what I find through my camera lens. These photos I took in the garden in my own front yard with an older film camera. I think this butterfly liked me. It just let me follow and snap photos as it graced all the flowers for about an hour that day. 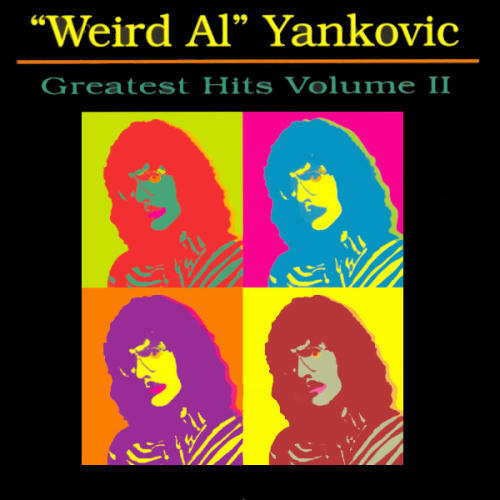 When I was a kid, Weird Al Yankovic was my all-time favorite artist. I remember I had a few of his cassettes – “The Food Album” and “Dare to be Stupid” – and I’d put a tape in my little Walkman, put on my headphones, and every night I’d fall asleep to songs like “I Love Rocky Road,” “I Want a New Duck,” and “Taco Grande.” I loved them all. Come to think of it, Weird Al was pretty much the only music I knew (besides stuff I got from my parents like CCR, the Steve Miller Band and Harry Chapin) but I was perfectly content with that. I don’t know what made me think of it, but listening to “White and Nerdy,” “Perform This Way,” “Yoda,” – more of my favorites – the idea just popped into my head. I found this photo by Dwight McCann and used it as a reference for my vectorish pop art fandom piece here. In a sort of ironic kind of way, after making this I found my old Greatest Hits Vol. II CD. These days all my music is digital – I haven’t really used a CD in years. I had completely and totally forgotten that the cover of that album was done in a pop art style, so I was seriously dumbfounded when I stumbled across it and realized the artwork I made today reflected the CD cover I hadn’t seen in about 15 years. So I just had to play around with more vector art after I saw it. Only this time I mimicked the album art on purpose. Although I’ll have to think of a better caption for this one, I think, I have to say, occupying myself with my vector tools and a blinding array of contrasting colors was sooo much fun. And I’m sure I’ll stop seeing spots any minute now. Ever get the feeling you’re being watched? I guess most people have. This strange and often unexplainable sensation could creep up on you when you’re hard at work on a project; or deep in thought; or maybe just doing the laundry. But have you ever felt like, whatever the situation, all of a sudden and maybe out of nowhere a little pair of eyes are staring directly at the back of your head, willing you to turn around so that these same little eyes can stare just as intently into your soul and quite possibly take over your brain? Ever get that particular feeling? Personally, I have yet to experience this exact thing (and I am in no rush to). But according to a friend of mine it could happen to anyone. Of course if I’m being honest, I stopped taking him at his word when he said a race of highly intelligent fruit bats stole his pizza that one time at the laundromat. I did actually almost start to believe his story (the one about the eyes staring into your soul and taking over your brain; not the bat thieves with a taste for pizza) though. Go ahead and call me crazy, but at the time, it was all I could think about. I was sitting at my desk, right where I am now as a matter of fact, quietly wrapped up in reorganizing some files when I felt a chill skitter down my spine; I was being watched. I’ll admit, it was quite late at night and my sudden spike in paranoia – feeling like I was being observed – could very well have been attributed to a severe lack of sleep. And that’s what I would’ve done, too, in any other case; brush off the feeling and move on. But I did have that eyes-boring-into-your-head-and-soul story fresh in my mind, ridiculous though I thought it was. But unlike most times when that feeling turns out to be nothing, this time it turned out to be something. I was actually, honestly, and truly being watched. To my great surprise these eyes did not belong to a creepy stalker or a soul-sucking alien being, but instead to a Purploid Baby. You can imagine my relief. Purploids are far more desirable than creepy stalkers and soul-sucking aliens, I can’t even tell you. I still really don’t know where this little one came from. But there she was just sitting on the edge of the desk contently staring at my file organization prowess. She’s been quite a wonderful house guest since that night, for she doesn’t take up much space and is happy to eat whatever she finds (she does seem to have a fondness for donuts, though – eating them, sleeping on them, whatever. She just like donuts). The little Purploid comes and goes as she pleases. But thankfully she no longer stares at someone unannounced; she’s kind enough to make sure we know she’s in the room before she stares. Just a few new uploads to toss into my ever increasing pile of celestial pieces. But even given all this, everyone still calls Melvin a monster. And for the life of him, he can’t figure out why. He’s cute, he’s little, he’s sweet. So where do they get monster in that? Perhaps Melvin will never know. But in the meantime he keeps his positive disposition, taking comfort in fresh coloring books, caramel apples and watching the Olympics. Please read through pattern before you start. In addition, the PDF version of the pattern (available below) contains extra photos for the body and head sections of the pattern. And also please note that while you may use any materials you like, just keep in mind other types of yarn or hook sizes have not been tested and thus your results may differ. Using suggested materials and keeping a tight tension, the pictured Melvin is approximately 5 inches (12.7 centimeters) tall. Use main color unless otherwise indicated. For neater stitches I recommend staggering increases and decreases for the head. Using the finished ear as a reference cut out an inner ear shape from felt. Attach to ear. Crochet around outside of ear to form a neat edge. The head is started with a foundation chain, then worked in the round. From now on work in the round. Do not join rounds. Attach eyes, horns, and ears. See photos for suggested positioning. The body and feet are worked as one piece, starting from the top (with a foundations chain that is joined once) and then worked down. Do not join rounds unless otherwise stated. Ch 24, join and work in the round on 24 sts. Repeat these rounds for second leg by working the remaining 16 sts in the round (see PDF for photo walkthrough). Sew up hole between body/legs and at bottom of feet if necessary. Cut out an egg shaped piece of felt and attach to the body. If attaching the tail via needle and thread, attach to the body now. If gluing the tail, I suggest first attaching the head to the body, then adding tail. See photos for suggested assemblage. **Tip:If you want to soften up your Melvin try blocking the pieces; if your yarn type allows, I find running my crocheted pieces through the dryer with my laundry really softens up my amigurumi, evening out the stitches nicely. (I would recommend trying this on scraps to test first). Once complete, be sure to give your Melvin plenty of love! And crayons. Fresh crayons. They’re important too. I find it somewhat fascinating, how easily it seems my creative passion can be shifted so drastically in such a short period of time. Two weeks ago my drive to create my digital pieces kept me up until all hours of the night. Last week I was pushing back the hours working with my own newest amigurumi patterns. A few other scattered bits of life have been keeping me occupied too, so I haven’t much been on the computer (or behind a camera lens). But I wish to soon continue my digital interests. Sometimes I can feel the inspiration welling up, and just that one little push will send me into a creative spurt. . . Just not tonight. Besides, inspiration or no, I still feel as though my stuff is missing something so very important. In a word, I’d have to call it skill. I feel for sure it’s something I can muster, but perhaps I can’t. Don’t know. Using black felt cut out two-four triangles for ears. Place and attach with needle/thread or hot glue. Attach eyes. Stuff head. Simply shape the first little gremlin finger by folding the chain onto itself and then either sew or glue in place. Repeat for the second finger. Once complete attach arm and feet. See photos for suggested positioning. Stuff firmly. Attach head.